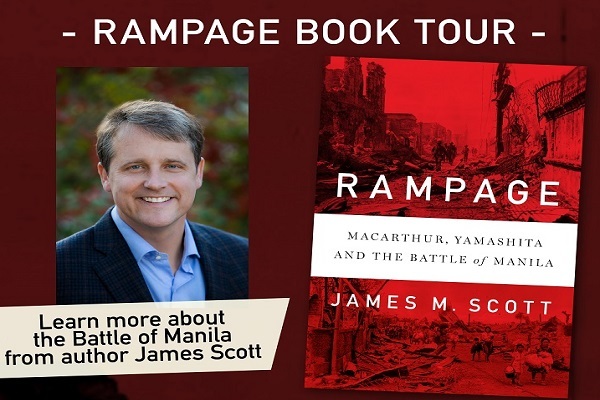 Written by celebrated author James M. Scott, Rampage delivers the definitive history of the monstrous twenty-nine-day battle to liberate the Philippine capital and its immediate aftermath, based on prodigious research in the United States and the Philippines, war-crimes testimony, after-action reports, and interviews with survivors. Other works by James M. Scott include Target Tokyo, a 2016 Pulitzer Prize finalist, The War Below, and The Attack on the Liberty, winner of the prestigious Rear Admiral Samuel Eliot Morison Award from the Naval Order of the United States. Copies of Rampage, as well as Target Tokyo: Jimmy Doolittle and the Raid that Avenged Pearl Harbor will be available for purchase at the event. Students are also encouraged to join the Battle of Manila Essay Writing Contest for a chance to win P10,000. Please visit https://tinyurl.com/battleofmanilaessay for the mechanics and registration. My grandfather CAPT MIGUEL DE LEON BONIFACIO, QMS, PHIL SCOUTS; my uncle MAJ CHARLES ANDREW POLLARD, CE, USAFFE and my father LT MARCELO BAÑAS JAVIER, HUNTERS ROTC GUERRILLAS were killed in action on 10 FEB 1945 during the battle to liberate Manila two months before I was born.